1st segment: Scot welcomes Fr. Chris back to the show. Fr. Chris went to Omaha this week to the Institute for Priestly Formation. There are now 175 seminarians spending 10 weeks in Omaha, where’s not much to do but pray and reflect. There are 7 or 8 men from Boston there. Fr. Chris mentioned the terrible Midwestern flooding affecting the area. They studied all four pillars of formation: spiritual, intellectual, pastoral, and human. Cardinal Sean is very keen on this program because it integrates the four pillars. The men come back excited that they learned to pray with Ignatian spirituality, which is helpful for diocesan priests who are active in the world, as well as the camaraderie with the 175 men from all over the United States. He’s also hoping to welcome 21 new men to the seminary this fall. It looks great for the seminary and the archdiocese. Scot wanted to go back to “praying like St. Ignatius”. Fr. Chris said it’s going deeper with the Scripture, taking a passage, praying with it, reflecting on it, imagining yourself in the scene, and then asking what the Lord is saying to you. In the seminary they are so busy, that it was great to be able to share time with the seminarians one on one in Omaha. 2nd segment: Scot and Fr. Chris welcome Fr. Ed. Scot asked him how he first experienced God’s calling to the priesthood. He didn’t hear until his late 20s, when he was living in Kentucky, working with a diocesan priest establishing the Christian Appalachian Project. He witnessed his life as a priest, his desire to serve, his love for the people. That was Fr. Ed’s encouragement. In hindsight, he realizes the Lord had been calling him for a long time. After college, Fr. Ed was an accountant at a top five firm. He graduated from Boston College in 1984, he worked for Arthur Anderson. He had great opportunities for a career, but after 6 years, he realized something was missing, that there should be something more. He went to the parochial vicar at his own parish at St. John’s, Wellesley, Fr. Joe Driscoll, and asked him about it. Fr. Driscoll told him to pray actively and to listen, and then he said he should try to hear the voice of the Lord. He felt the Lord calling him to work with young people so he went to work in Franciscan Children’s Hospital. In the late 1980s, he was laid off from his job and so he became more involved at Franciscan Children’s Hospital as a full-time volunteer. He says he never knew how many Catholics worked at his firm until he was leaving although he had worked with them for years. A lot of them were active Catholics in their parishes, but it never came up until he was leaving and it came up that he was going to be a volunteer. After a year, he felt his call was to help disabled adults get into the workforce. This was at the time that the Americans with Disability Act was coming into force. He decided to spend some time away and then come back and work for disabled adults. His sister went to Kentucky on spring break and so he decided to spend three weeks in Appalachia helping out. But then he stayed for six weeks because so much was going on there. On the last weekend of his trip, he met the founder of the Christian Appalachian Project who asked him if he was going to stay for a year-long commitment. He came back to Boston, but then he felt called to go back to Kentucky and so he went back to work directly for this priest for three years, starting up local Catholic communities. Father was encouraging to him to enter the priesthood, but Fr. Ed felt called to stay. But it was on the last year of his volunteer work that he really felt the call to return to Boston for the priesthood. Fr. Chris said we often think of the missions as being in a faraway place, but Fr. Ed worked in Kentucky. Western Kentucky is very Catholic. One of the first five dioceses in the US was Bardstown, which is now Louisville. The 50 counties of Eastern Kentucky in the Appalachian foothills are very poor. One-third of 1 percent are Catholic in Eastern Kentucky. There are more Catholics in India and Pakistan as a percentage. There are many Christians there, but they don’t have the Church. The total square mile of the parish of the priest he knows in Eastern Kentucky is 800 square miles. One of his previous parishes was the size of the state of Rhode Island. 3rd segment: Fr. Ed was ordained on May 27, 2000. He was assigned to St. Catherine of Siena in Norwood, one of the largest and most active in Boston. There is something special about your first parish, but it’s a wonderful parish of faith-filled families and a parochial school. He arrived there at the same time with two other priests: the pastor, Msgr. Cornelius McRae, Fr. John Currie, and Fr. Ed. They had a wonderful experience. Every day they could, they prayed morning prayer together. They found the town of Norwood to be very open to the life of the Church and worked well with the parish. His next assignment was in 2005 and was assigned to Immaculate Conception in Weymouth, another large parish. He had asked to be assigned wherever he was needed. He was there for two years in Weymouth, where there were five parishes and three elementary schools. Then he was assigned to St. Joseph, Holbrook, as pastor. There’s a big difference between being a parochial vicar and pastor. It’s much smaller than Norwood, but still very good faith-filled families. They have an elementary school and he loved being part of the school when he was there. He got the call to St. John’s Seminary after two years. He had thought that he would be at St. Joseph’s for at least 6 years and perhaps a second-year term. It was a harder transition. He remembers praying the day before he got the call that he prayed to turn over His entire life to God, whatever he wants. Fr. Ed said the people make you the priest you become. 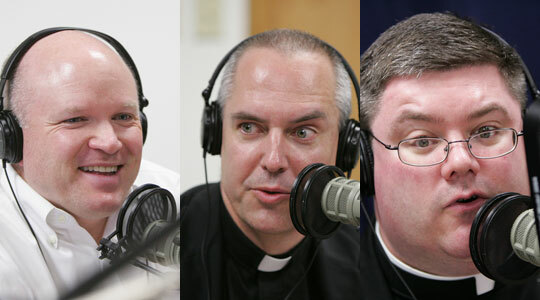 Parishioners deserve a lot of the credit for helping priests becoming who they are. His work in the parish helps him now as he works with seminarians preparing them. His primary responsibility is to assign seminarians for their pastoral assignments and to help them, along with their on-site supervisor, to help them grow. The men share their work with him and he encourages them. What he loves most about being a priest is being able to celebrate the sacraments. This last weekend, he helped out at St. Paul Parish in Hamilton and it was a joy and privilege. He loved the celebrations to experience family, community, and grace coming together. 4th segment: Fr Ed is also the Dean of Men. It’s like the Dean of Students at a university. He works with the men on day to day functions. He coordinates illness and absences. There’s a lot of scheduling items for the whole community. He sees it as a role like being a father to them. He equates it to what his brothers do for their families or provincials do for their religious communities. He helps them work around some of the snags. When a seminarian has an issue, Fr. Ed is the first call he makes. Sometimes it’s Fr. Ed making the call to the seminarian. It’s an opportunity for growth. Fr. Chris said when men have gone to the hospital, Fr. Ed is the man on the scene. The Dean of Men is about having a well-functioning house. Anytime 100 men live under one roof, there will always be issues. He looks out for the common good. As Formation Director of Pastoral Ministries, he starts the year by meeting the men, finding out their skills, what they like, and where they need growth. Then he looks at apostolates where they can be assigned: parishes, nursing homes, prisons, and other ministries. He follows up with their on-site supervisors. The supervisors meet with the men to make sure they are integrating their experiences: what are they learning, how did that touch their spiritual life? Fr. Ed’s work is to help them see their own personal growth toward ordination. About 50 percent of the pastoral assignments are in parishes. The men have pastoral assignments for five of the six summers they are at the seminary. Most of the men in the early years are familiar with the parish setting when they come in so they get assigned to the institutional settings to give them more experiences. When they are in their later assignments, they get parish assignments. Near the end of the seminary, they get two years in one parish to give them more time to experience the life of the parish. During the school year, they spend their weekends in the parish. The men are evaluated twice per year on their pastoral assignments. Those evaluations by the supervisors are used in the overall evaluation of the seminarians toward ordination. You can see a lot of gifts and talents in their pastoral assignments that you wouldn’t see inside the seminary walls. Fr. Chris said that at ordination Cardinal Seán asks the seminary rector if they have inquired among the people whether the determine these men worthy. That’s where these evaluations come in. Fr. Ed said he gives credit to a lot of the seminarians for their willingness to experience these opportunities for growth. Many of them came to the seminary after having been accomplished in life and now they place themselves often in a more subservient position than they were used to. 5th segment: In addition to his other roles, Fr. Ed is also Cardinal Seán’s representative to Catholic homeschoolers, is involved with the World Apostolate for Fatima, works with the Master in Ministry program. He also works with the Master’s in Ministry program, helping lay students with their pastoral formation, which is two years of field education. They are assigned by their choice to a ministry and he works with them and their supervisor. They work 4-5 hours per work in these assignments. It’s different because he’s not choosing the assignments, but he does have to approve it as engaging their intellectual, spiritual, pastoral and human formation. As spiritual director to homeschooling families, he is the contact for families who need help from the Archdiocese and he gives support to them. There are literally thousands of families in the Archdiocese that homeschool. He finds a lot of the families are very faith-filled. they integrate faith into regular academics. He works with a couple of communities of homeschooling for holy hours once per month. For someone who wants to find out more about the homeschooling, go to BostonCatholic.org and connect with Fr. Ed. He’s also the uncle to 30 nieces and nephews under the age of 15. They complement his ability to be a better priest. It means a lot to have brothers and sisters who are raising their children in the faith. His father also inspires him in his faith.